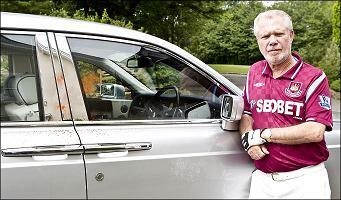 A YOUNG boy was caught up in a yob attack in which Aston Villa fans bombarded former Blues chairman David Gold’s car with beer bottles and pint glasses. 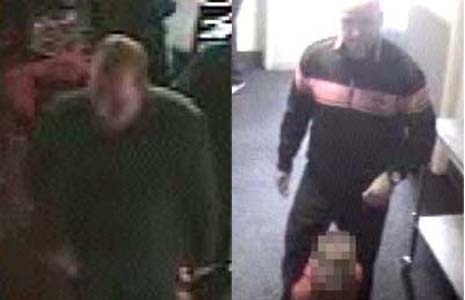 Newly-released CCTV images of two wanted men showed one of them with a small child. Other footage showed a second man throwing a glass at Mr Gold’s Rolls Royce Phantom car at full force from only a few feet away. Mr Gold, now chairman of West Ham United, described the incident as the “most frightening experience of my football life”. It happened outside the King Edward VII pub, near Villa Park, on August 14. It was the first day of the new Premier League season and came after Villa beat West Ham 3-0. Mr Gold, aged 73, said he feared one of the bottles could have smashed a window and killed his 65-year-old driver had it not been for his car’s toughened glass. He has now offered a reward totalling £5,000 for information leading directly to the conviction of the thugs. “It was the ferocity of the attack that struck me,” he said. “I’m there with a friend, also 73, and my driver and this young hooligan, this monster, charges at my car. With the most incredible force throws a bottle of beer or glass. “It that bottle had hit anyone it would have killed them. Then unbelievably, a second guy does it. We were three elderly gentlemen sitting in a car. The attack came seconds after Mr Gold stopped to sign an autograph for a young disabled Aston Villa fan. It was thought up to 20 people were outside the pub when the incident happened. Pc Colin Barlow, of West Midlands Police, said: “This was a cowardly and unprovoked attack in which someone could have been seriously injured..
“There is no place in football for this type of behaviour and I would appeal to Birmingham Mail readers to come forward with any information they may have.” He added that, if convicted, the offenders would face orders banning them from football matches for at least three years.